Ferryman Charlie Dawson saves dead people—somebody has to convince them to move on to the afterlife, after all. Having never failed a single assignment, he's acquired a reputation for success that’s as legendary as it is unwanted. It turns out that serving as a Ferryman is causing Charlie to slowly lose his mind. Deemed too valuable by the Ferryman Institute to be let go and too stubborn to just give up in his own right, Charlie’s pretty much abandoned all hope of escaping his grim existence. Or he had, anyway, until he saved Alice Spiegel. To be fair, Charlie never planned on stopping Alice from taking her own life—that sort of thing is strictly forbidden by the Institute—but he never planned on the President secretly giving him the choice to, either. Charlie’s not quite sure what to make of it, but Alice is alive, and it’s the first time he’s felt right in more than two hundred years. 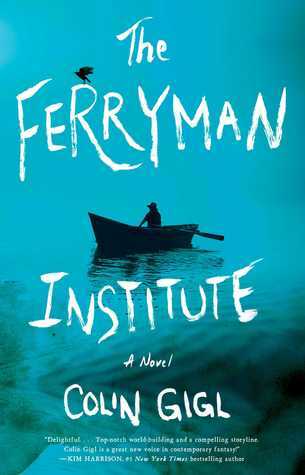 Written in the same vein as bestselling modern classics such asThe Eyre Affair by Jasper Fforde and A Dirty Job by Christopher Moore, The Ferryman Institute is a thrilling supernatural adventure packed with wit and humor. This book wasn't what I expected. It was action-comedy fantasy not darker like I thought. And the characters were so flat. They had no personality to them. And there isn't anything action-y that happens.